i love the blanket. i hope you get lots of use out of while r & r 'ing. whoohoo. hey there. i came over from rummage. i love the quilt. great colors! what a stunning combination of colors! enjoy the beach...our high here today was -7...beach sounds soooo much better! Hope you're having a wonderful 1st Christmas with Mae. I've just found this happy place of yours. I'll definitely pop back for a visit in 2009. The mornington peninsula is my happy place. So many great spots. If you're still here & have access to your posts???? For great food & fun in Rye check out Baha on the main strip. For a wonderful winery experience check out T'gallant for casual vibe or Tuck's Ridge for some more serious dining & wining. Heronswood Gardens in Dromana are lovely & shady on a hot day. And beaches well... there are so many to choose from & I'm not telling my favourite secret quiet place here. thanks for your comment on my blog! she's still gorgeous and the cutest baby around!! 8 weeks 6 days old today. Gosh, those are lovely fabrics! Just foudn your site today via the mixtogether email. 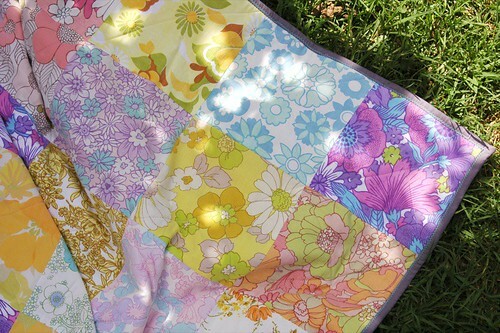 Loving that picnic quilt.